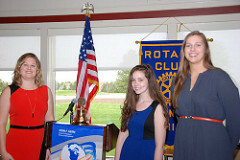 This morning's presenters were two Coffman students, Ellie Blankenhorn (center) and Paige Warren (rt), and their Broadcast Video Instructor, Amanda Blackburn (lt). Amanda is an instructor at Tolles Career & Technical Center. Tolles works in each of the Dublin School District and provides instruction in all three Dublin high schools. As part of their studies these students, along with Coffman students Abby Vollmer & Kylie Young, created a public service announcement video which was later entered into a competition sponsored by the Business Professional of America. Their video, Tire Safety, was entered into regional competition. The all girl team won first prize and will be competing at a national competition in May! This morning's presenters were two Coffman students, Ellie Blankenhorn and Paige Warren, and their Broadcast Video Instructor, Amanda Blackburn. Amanda is an instructor at Tolles Career & Technical Center. Tolles works in each of the Dublin School District and provides instruction in all three Dublin high schools. As part of their studies these students, along with Coffman students Abby Vollmer & Kylie Young, aka Team PEAK, created a public service announcement video which was later entered into a competition sponsored by the Business Professional of America. Their video, Tire Safety, was entered into regional competition. The all girl team won first prize and will be competing at a national competition in May! After watching the video, Ellie and Paige shared the process of creating the video. From concept to script, storyboard to software, it clearly was a complex process that took months to complete. The helped the team learn new skills and even influenced some of their decisions for future careers. Now the team is practicing for nationals where the top ten teams will be challenged to create a video in only three hours! Good luck, Team PEAK, we wish you great success at nationals!